Your shoulders are the most complicated joints in your body and thus, one of the most easily injured. They have to move through an incredible 180 degrees of motion, while still maintaining stability and strength. Some of the most important muscles in the shoulder are actually the smallest. The rotator cuff is a series of 4 muscles that form a cuff around the glenohumeral joint. Although they are small, they are vital to guiding how the shoulder joint moves. When these muscles are weak or injured, the humerus bone can jam up into the socket (glenoid) of the shoulder blade. Keep your shoulders aligned by doing postural exercises – The number one reason for repetitive injury and pain in the shoulders is from poor posture. With prolonged slouching, the shoulders protrude forward changing the mechanics of the joint movement. This weakens the rotator cuff and scapula (shoulder blade) muscles. It predisposes you to injury. Improve your scapula stability – The scapula (shoulder blades) are part of your whole shoulder complex. 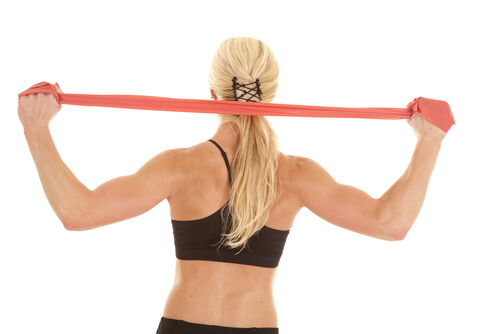 They have many different muscles pulling at just the right time to guide them for proper shoulder movement. Every time you reach, pick up or pull, you use your scapula. Improve the stability of them by performing scapula exercises. A simple exercise is standing against a wall and gently trying to pinch your shoulder blades together, while keeping your arms relaxed. Perform 10-15 repetitions, holding the contraction for 5 seconds. By working on these 3 simple actions, you can dramatically improve the performance and feel of your shoulders. You should also consider making an appointment with a physical therapist. Our physical therapists are experts at analyzing the complex movements of your shoulders to determine the exact cause of your achy or sharp pain. If your shoulders feel weak, achy, painful, or if you had previous surgeries, give us a call today. We will definitely get your shoulders feeling limber, stronger and allow you to get back to doing life’s everyday activities pain free.